You want to prevent users from submitting a form if certain criteria is reached. For example, you’re hosting events with limited seating. 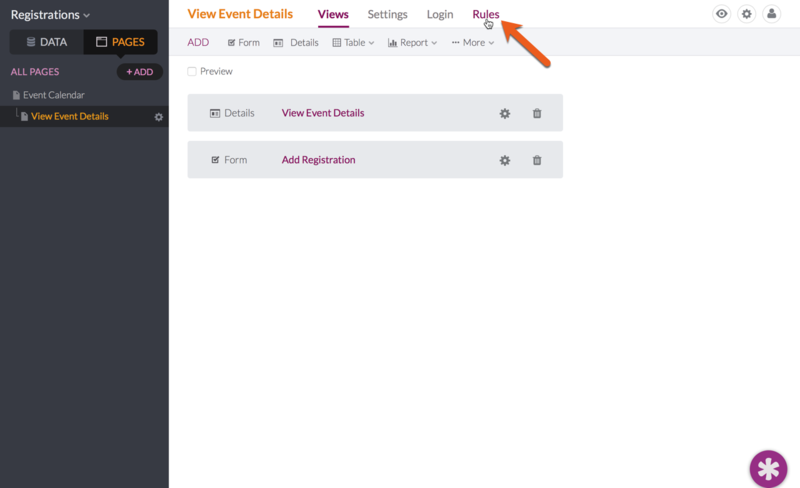 Once the seating limit for the event is reached, you want to make sure no more users can register and alert them that the event is full. In Knack, this kind of scenario can be accomplished using page rules. You’ll need to store the number of children (registrations) that each parent record (event) is limited to. Before you can prevent the user from doing anything, you need to know how many registrations have already been submitted for a specific event. Knack Tip: Don’t see a "Count" field as an option? 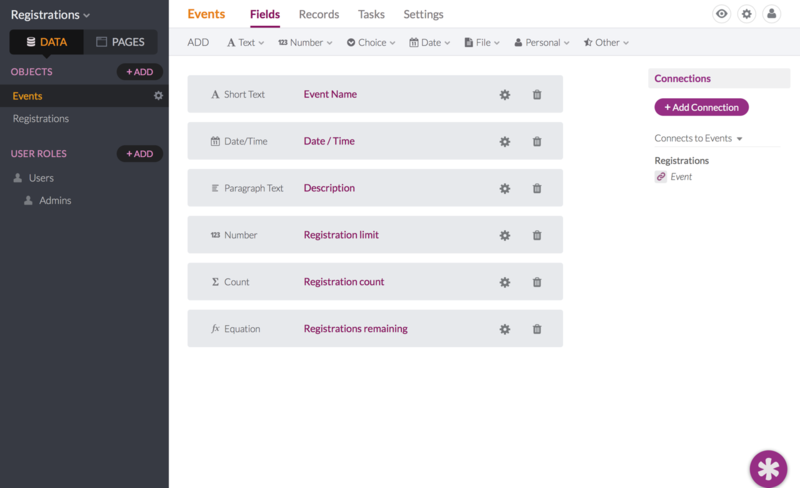 Make sure that your Registrations object has a connection pointing to the Events object. Now you can calculate the remaining registrations by subtracting the count field in step 2 from the limit field in step 1. 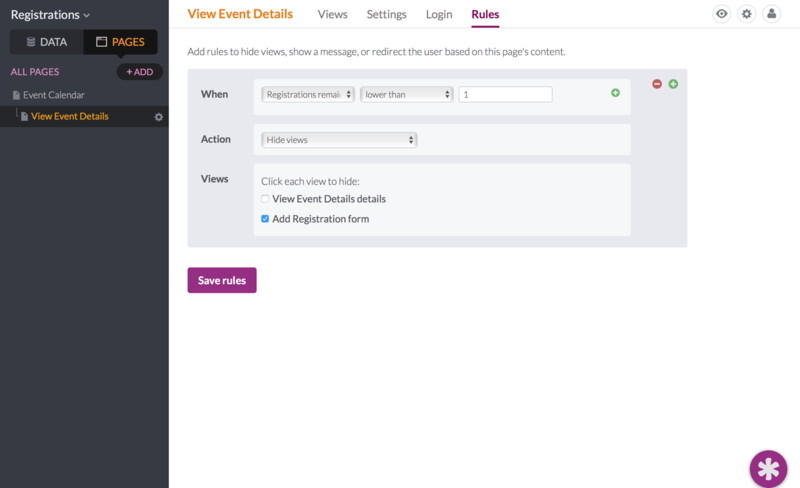 Find the start page that users will access to view the events. If you don’t have one yet, you can follow the steps here to create a new one. If you already have an existing start page with views, you can click on the "Links" tab in your view to add a new link to view more details as seen here. Knack Tip: Not seeing the form option for "Registrations"? Make sure you have a connection between the the Event and the Registration. 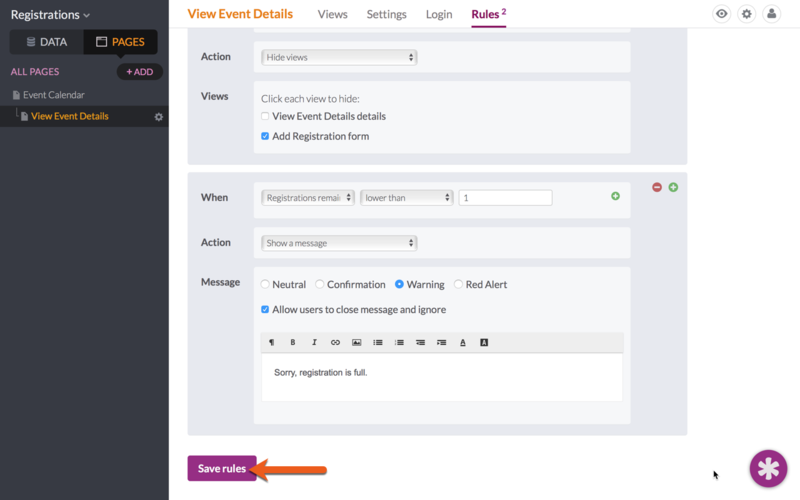 The final step is to add page rules that will trigger when the number of registrations reaches the limit. Set your rule criteria so that it triggers when "Remaining registrations" is lower than 1. Add a second rule with the same criteria as the first rule and set the "action" to “Show a message.” Finally, configure your message by choosing between four different backgrounds, writing your own message, and choosing whether the user can or can not dismiss the message. You’re now successfully hiding the registration view as soon as the registration limit reaches 0! This will not prevent a single user from submitting multiple registrations, the count is based on all connected children records. You can add filters to your count and only track ‘paid’ registrations, exclude ‘cancelled’ registrations, etc.